What is this new Onetharam Chat service all about? 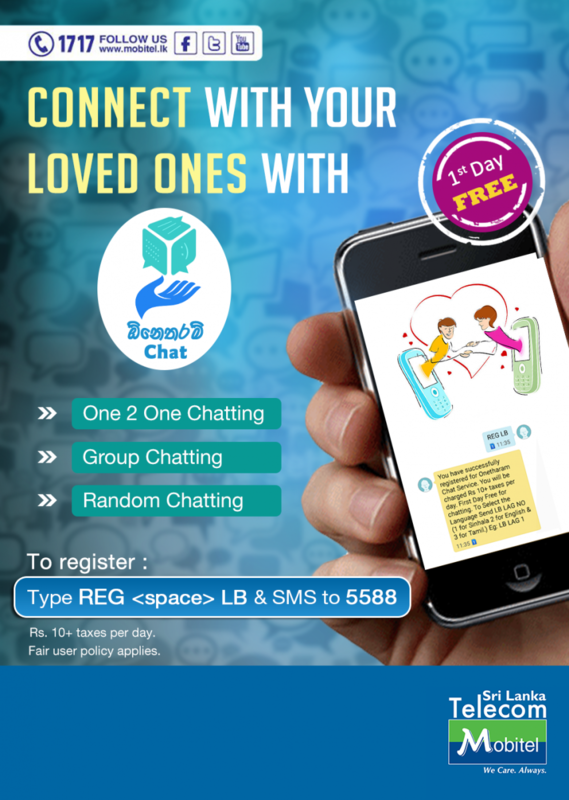 It is an SMS based chat service which allows users to chat with friends, make new friends as much as you want. However, there will be a fair user policy. How do I participate in this service? How much do I get charged for the service? Once you send an SMS to 5588 stating REG LB, system will request you to create a profile, where you will have to enter your nickname, gender, age, etc. Is there any trial period for this service? What are the keywords used in the service? What is the new STARFRIENDS WAP service all about? Do I get a confirmation when I subscribe for the service? Yes. You will be informed via an SMS regarding the subscription. How do I deactivate from the service? What is the CELEBS service about? How does a customer subscribe for this service? How much does Mobitel charge a customer for using this service? Customers will be charged Rs. 2 + tax per day per celebrity and will be entitled to download 2 items daily . Additional downloads will be charged on content basis. Who are the celebrities on this service? Contents of following celebrities will be available and many more to come. Where can customers get more information regarding the service? Upload that special moment or that crazy experience and share it with your loved ones and friends. You could upload a video clip via the web interface or directly call the system and start a video recording. Video Blogging is very similar to regular blogging, but this service comprises of additional enhanced audio/video features. Capture important events with your mobile video and share them by dialing into a video-enabled blog or by directly uploading a video clip using the web interface. To access Video Blogging via Mobitel, make a video call to 555/557 (Call charges: 3.00 LKR/min). Charges (per request): Rs.2 + Tax. All Gmail users can now send FREE SMS to your Mobitel user contacts through your Gmail chat window! Log into your Gmail account. In the Send SMS box, enter the Mobitel number of the person you want to contact. In the dialog box, enter Contact name of the SMS recipient. Then, click Save. Type the message in the chat window and hit Enter. The message will then be sent to the Mobitel number as a SMS sent from the mail address of the Gmail user. If the Mobitel user replies, the text message response will appear as a reply in Chat and the conversations will be stored in the Gmail user’s Chat history just like regular chats! If you are a first time Gmail chat user, you would need to enable a Chat application to enjoy this feature. Reply SMS will be charged at 25cents (+ tax) for the Mobitel user. Twitters without a doubt the best way to share and discover what is happening at present. And now, you can be in touch with all those whom you follow and your followers. Just tweet straight from your Mobitel! Now you can tweet via SMS or MMS on your Mobitel number. Simply compose a text message containing the text of your Tweet and send it to 40404. Connect with your friends anytime, anywhere! Access Facebook from your Mobitel to connect and share your experiences with people in your life. Update your status from your mobile via SMS or view the mobile-friendly Facebook zero version at wap.mobitel.lk.